Carl Froch vs. George Groves Hours Away: Who Wins? A few weeks ago, I would’ve confidently picked Carl Froch by early to mid rounds KO. Now, I’m not so sure – but I’m still leaning towards the Cobra. Groves has done a fantastic job of getting under the champion’s skin; refusing to play the respectful ‘happy to get my opportunity against a great champion’ role and consistently confronting the WBA/IBF belt holder with a series of flaws – or ‘truths’, as Groves likes to call them – that he has found in the Cobra’s résumé. Froch, for his part, has largely tried to play the cool champion who isn’t fazed by a disrespectful young upstart. He hasn’t carried the act well though, and at times has seemed irritated by Groves’ ability to calmly analyze his words and turn them cleverly against him. It’s fair to say that Groves has got the better of Froch in the pre-fight bickering that is so much a part of the psychological battle in a big fight. “I’m chinny,” said Groves at the final press conference before the fight on Friday. “I’m chinny – but I’ve never been knocked out, 19-0, unbeaten. But I am chinny.” He went on, in a sarcastic retort to Carl’s previous claims. The Smart Alec tone might not have been to everyone’s liking, but he made a fair point. “What was the other thing you mentioned Carl?” he asked cheekily. The Cobra took a deep breath, rolled his eyes, feigning boredom but showing apparent frustration, and refused to play ball. “I can’t remember George”. “He’s said the same stuff so often, and he’s contradicted himself so often, it’s hard to follow with whatever Carl’s coming at” continued Groves. The brief exchange epitomized the verbal back and forth that has been taking place in the weeks leading up to the big fight, and the numerous Sky TV appearances where they’ve been pushed into the same breathing space in order to promote the bout: Carl making a case for why he will simply walk through Groves and knock him out; Groves calmly and analytically dissecting the champion’s points one-by-one in a neat game of word-chess, before the Cobra then loses patience and disengages from the conversation, but ultimately looks to have come off second best. “Ridiculous, embarrassing, pathetic!” the champion finally shot back in the press conference, pointing angrily at his challenger. “You’re in a world of trouble [come Saturday night], and you’ll learn some respect”. There is a fine line between the advantage gained by getting under your opponent’s skin and thereby taking him out of his game plan, and the disadvantage incurred by providing him with the extra motivation he needs to push himself that little bit harder in the gym and increase his desire to punish you during the fight. It is difficult to judge in this case whether George is likely to benefit from his tormenting strategy leading up to this fight. 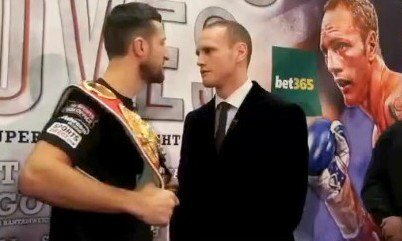 Froch will undoubtedly sling some serious leather in Groves’ direction on Saturday night, and probably try to take his head off with more than a few right hands in the hope of making him pay for his pre-fight taunts. But then, we have to remember that this style of fighting constitutes nothing more than a normal day at the office for the battle-hardened Englishman, so we should not necessarily view this type of approach as being a success on the part of Groves’ pre-fight psychology. What would be more worrying is if Froch were to pursue such a ‘bombs away’ strategy to the detriment of his points tally. If Groves is able to play the matador to Froch’s raging bull – even for the first few rounds – out-jabbing and out-slicking Froch on the back foot (much like he did when outpointing rival James DeGale) it could create a situation where the champion is forced to dig himself out of a hole on the scorecards. This, in turn, could lead to more recklessness – which could continue to play into Groves’ hands, assuming that attempting to outbox the champion is his chosen path to victory. I cannot see any other path to victory available for the challenger. Groves does have an extremely powerful overhand right that could surprise Froch somewhat, but while he may gain the champ’s respect with it, unless he has a concrete block hiding under his glove we can be pretty certain that he will not win via kayo. And despite the fact he has promised to meet Froch in the centre of the ring, this does not seem a realistic option, considering the Cobra’s tendency to tear through opponents who oblige him in that regard. When analyzing the champion’s record, Groves was quick to point out the occasions when Froch has been out-boxed and come close to defeat (Jermain Taylor and Andre Dirrell were mightily close to beating the Cobra on points – Taylor being knocked out with only seconds to spare and Dirrell losing a disputed decision) or when he has actually lost (first to Mikkel Kessler and then later to Andre Ward). On every occasion the opponents had success by implementing a more refined boxing style – moving, staying on the outside, refusing to trade (with the exception of Kessler), and employing solid, simple fundamentals such as an effective jab and a strong back hand behind it. It would therefore strike me as very strange to see Groves attempt anything that strays too far away from this strategy. Can he succeed? I don’t think so. While Groves’ mind-set has been impressive in the build-up to this fight, and he has made a convincing case to show that he sincerely and completely believes in his own ability to win, I do not think it will be quite enough to overcome the greater experience of the champion. If we consider the level of opposition Froch has faced over the last few years, he doesn’t just have an impressive record in comparison to George Groves – he has an impressive record in comparison to any super middleweight in the history of the division, or any British fighter at any weight, ever. That is not hyperbole: it is a fact that over a period of five years – going all the way back to the night he won his first world title against Jean Pascal in December 2008 – Carl Froch has fought a higher quality of opposition than almost any other British fighter you care to name. He didn’t win all of them, but he learnt a hell of a lot about world-class boxing along the way, and you simply cannot buy experience like that. Froch showed in his most recent win against Kessler and in probably his most complete victory over Arthur Abraham, for example, that he has the capacity to adapt in the ring, box a bit, and fight to a more disciplined strategy when required. He has also shown against Lucian Bute that he has the ability to obliterate world-class opposition if they do not have sufficient strength and guile to hold him off. And, finally, he showed against Andre Ward that he has the talent to live at the highest echelons of the sport – coming off second best overall, but without shame in defeat, against the number two pound-for-pound fighter in the world. Groves’ most impressive win to date, in contrast, was a razor thin points victory against his bitter amateur club mate, Olympic gold medalist DeGale. It was an excellent win for ‘Saint’ George, but it was a monumental struggle in which he made it over the finish line tired, bloodied and bruised. I can see a very similar type of fight playing out against Carl Froch – with the Cobra being the front-foot hunter, while his challenger tries to box off the back foot to win rounds, and then surprise the champion with sneaky, powerful right hands to gain his respect and sow an element of doubt into his attacks as the fight progresses. The only difference on this occasion is that while Groves will still finish the fight bloodied and bruised, this time it will likely be a few rounds before the finish line, with the referee saving him from his own bravery and calling the contest to a halt somewhere around the ninth. You are here: Home / Boxing News / Carl Froch vs. George Groves Hours Away: Who Wins?